This is a basic joint. One side has a groove machined in it and the other has a tongue. All these boards today are made on multi-headed machines that make the complete board in one pass. For small jobs to match existing boards, they can be made with either a router or a spindle moulder. These are "Vee" jointed boards. 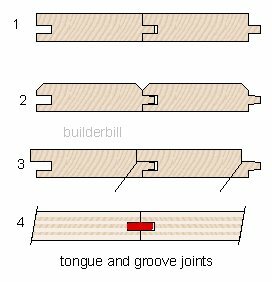 The point of doing this and also many other beaded edged T&G joints was to disguise the fact that joints open and close with the seasons. So on wall panels or outside doors they made a feature of the joints, rather than trying to hide them. Boards like this, quite often with beaded edges were known as Match Boards. This is a modern profile that is optimised for secret nailing. The position of the nails are shown, and you can see that there is more timber for the nail to grip tan in the first example. What you see is a section of flooring ply. The ply sheets have a groove around the outside edges and a Loose Tongue is fitted into the grooves. In the instances that I have seen the tongues provided by the ply manufacturer are made out of a plastic material. Above is a detail from my flooring page. 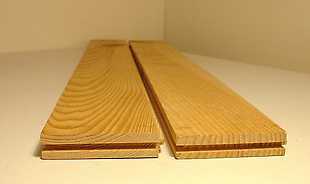 At the right is a photo of End Matchedfloor boards. That is the ends also have T&G joints. This is a great material and time saving technique. No long have floor boards to be jointed on top of floor joists, with the attendant waste of material and labour. End matching has been a boon to the timber mills also because they can use ever shorter lengths of timber and so fully utilise our dwindling timber resources.